There’s a man taking a stand seat (in Melbourne), in an ingenious PR stunt. 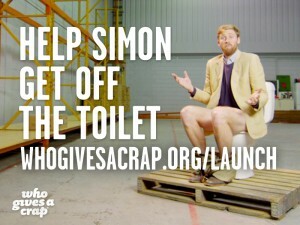 Simon Griffiths is not leaving the toilet until he raises $50,000 for the first bulk production of ‘Who Gives a Crap’ – the feel good toilet paper that uses 50% of its profits to build toilets in the developing world. See for yourself here – it’s live. 2 comments on Who Gives a Crap! ?